When you’re weary of winter…. Off to work on proofing more fae books. Four of the updated print books are available for sale, two I’m editing this morning and sending back in for review, and then I’ll proof two more today! Perseverance is the key! Look close, look far…it’s amazing what a different perspective you can have. What we have: looking up through the shaded trees on the wetlands walk to see the brilliant sun; long distance shot at the arboretum, fall colors and flowers, shadows and light, and a path that leads you to the building; a grizzly bear close up, chomping on the fence to give you a bear hug; looking down–parakeets having a disagreement. I didn’t have any time to work on My Highlander, well, let me amend that–I was taking care of grandbaby, took the dogs into be groomed, did a little shopping, bought a new strand of Christmas lights, well, two, and one half of one didn’t work, and worked on setting up the tree for pictures for Christmas. Oh, and picked up puppies! But….I DID write 200 words. See? I wanted to, but didn’t think I’d have time. I didn’t feel like I should mention it because it was ONLY 200 words. But 200 words is…200 words. My incentive? Not only to keep at it, but I didn’t want to show one “dropped” day on writing every day for NaNoWriMo, even though I’ve made over 50K. Working on getting to 60K, hopefully, today. My daughter tells me we’ll shop for groceries today, tomorrow or Monday. Hmmm, that narrows it down. So I need to write in the meantime. I cleaned house, but the puppies have already brought in a ton of more pine needles. I need to vacuum my yard. Giraffes, Pumpkins, Parrots, Oh My! Have a wonderfully wild day!! 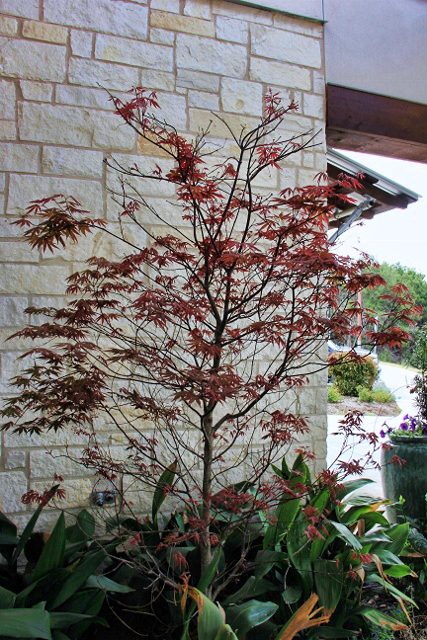 I adore Japanese Maple trees. They’re beautiful, like lacy sculptures of fine art. But they don’t like me. I’ve tried, and so did my mother, several times to grow them. Alas, I left well enough alone and now that I found a beautiful specimen at the Arboretum, if I decide I just have to have another, I can look at this one and get over it. Persistence can be a good thing. But sometimes we have to compromise! Have a terrific day. What day is it now??? When I was at the Arboretum, I was fascinated not only by the flowers and gardens, water gardens, nature walks, garden structures and statues, but also by some of the buildings there. This one had the prettiest stained glass windows. And I even managed to capture me in the beauty. 🙂 The rainbow of colors, the flowers and leaves? I had never seen it before. And yet, it had always been there. I wonder how many other things I have seen, but… have never seen? 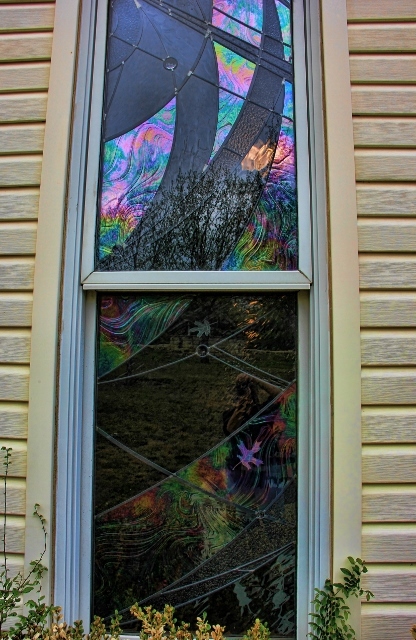 Don’t you love the artistic window?